The Third Asian Ministerial Conference on Tiger Conservation began today in New Delhi and was inaugurated by the Hon’ble Prime Minister Shri Narendra Modi. 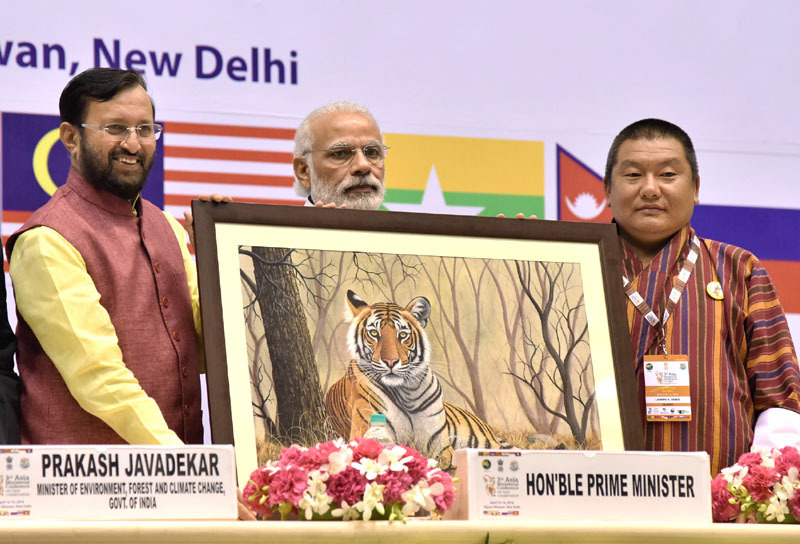 Others present during the inaugural ceremony included Ministers from Tiger Range Countries; Minister for Agriculture & Forests, Royal Government of Bhutan; Chairman, Global Tiger Forum and Environment Minister Shri Prakash Javadekar. The PM also highlighted how the while the benefits from tiger conservation are enormous but they are also intangible. He also urged how neither is it possible to quantify the benefits provided by the tiger in economic terms nor should we make such an attempt. “Since Mother Nature has bestowed the tigers for its own conservation, it becomes our bounden duty to conserve them,” the PM noted. The PM also expressed his concern over the reducing tiger habitats across Tiger Range Countries. The situation has been aggravated further by the ongoing trafficking in body parts and derivatives of this magnificent animal. The Prime Minster highlighted how working to protect the tiger is therefore the need of the hour especially since a viable tiger population undoubtedly symbolises a mitigation strategy for climate change as well. The Prime Minister also mentioned Government of India’s role in tiger conservation, which began largely with the setting up of Project Tiger in 1973. The coverage of Project Tiger has increased considerably from the initial 9 tiger reserves to 49 at present. Project Tiger is a joint effort of the Centre and the State and due to such collective efforts, there has been a rise of thirty per cent in the number of tigers in India. It has gone up from 1,706 in 2010 to 2,226 in 2014. A national repository of tiger camera trap photo database, which is being created. The Prime Minister also added how, this year, funds allocated for tiger conservation have been doubled from Rupees 185 crores to Rupees 380 crores. The Environment Minister Shri Prakash Javadekar also addressed the gathering and strongly emphasized that India has ‘Zero Tolerance’ against wildlife crimes such as poaching. He said that the recent case of poisoning of tigers in Pench Tiger Reserve is unacceptable and that all the culprits have been arrested and will be severely punished. “We lead by example and are committed to cooperate with other Tiger countries”, the Environment Minister declared.